Your computer’s home is as important as your computer itself. 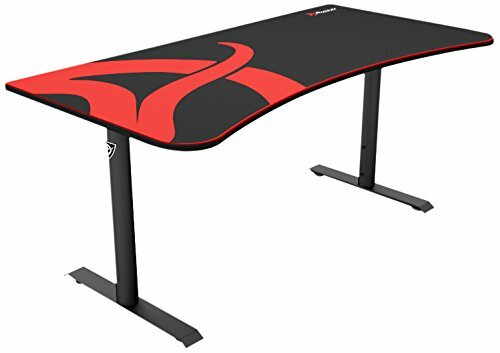 If you’re a serious gamer looking to upgrade your rig’s station, then you should check out this list of best gaming desk reviews that will help you decide which one you should buy. These desks also apply if you are an office staff that uses a computer a lot, or you just moved into a new place or home, or you’re just looking for a computer desk with a beautiful style that doesn’t look like something that Ikea rejected. The followings are the list of best gaming desk reviews you are looking for. When it comes to what is the real best gaming desk in these days, Arozzi Arena Gaming Desk is the first one. It has the completely new design, height adjustment feature and the unique cable management mechanism. Hence it provides gamers the maximum comfort for long play. Arozzi Arena Gaming Desk can have three monitors on it because of its 5′ 3 inches width. The depth of 2′ 7 ½ provides more space for your mouse and keyboard. It comes with five best attractive colors – red, blue, green, white and black – and exclusive mousepad that you will love. Supported by black metal arranged in a beautiful architectural form, it is very lightweight, durable and perfect for small spaces. A straightforward yet elegant design that has enough room for your speakers, monitors and gaming PC, even though it is relatively small and doesn’t take much space itself. Very easy to clean and maintain, and very easy to assemble. This desk can be bent into an L shape because its middle is curved, which allows it to fit almost anywhere and provide more space when needed. It includes a slide-out keyboard shelf that can take your mouse and your standard size keyboard together, and it’s provided with a safety stop. It looks very stylish if put in a corner. It is straightforward to install and comes with all the tools required to assemble it. Its metal design and the materials used to manufacture it make it very sturdy and durable. This is an extremely durable and heavy-duty desk; it weighs only 44 lbs. But it has a load capacity of nearly 800 pounds. The panel is environmental E1 standard particle wood, waterproof, anti-scratch and has a high gloss finish. The legs are adjustable, which can help make it very stable even on uneven floors. Its simplicity makes it especially easier to assemble and makes it go with any home themes. The glass top panel and cherry laminate finish make this desk look gorgeous and perfect for a modern wooden theme home. Don’t let the glass panel fool you, this desk is very sturdy, and it can support whatever you put on top of it. The only bad side of this desk is that it can be a little tricky to assemble. This desk will make you avoid the burden of constructing it. You open the box; you unfold it, and voila! In just a few seconds, it is ready to be used. As with most desks from the manufacturer “Need,” the panel is environmental E1 standard particle wood, Anti-scratch, waterproof and has a high gloss finish. Legs can also be adjusted to stabilize it on uneven floors. Incredibly durable, with a load capacity of about 800 lbs. It is very portable because it can be folded, you can easily move it from one room into another, or even fold it for storage when you need the space it takes. This desk is the smaller version of the previous desk, it weighs less, but it can do everything the other one can. Perfect if you’re looking for the features of the 55″ desk, but you do not have enough space. This desk’s minimalist design makes it look perfect for an Apple Mac or an Apple TV. It has adjustable leg pads for stabilization, sturdy metal legs, and one of the most useful features is that it has an extensive space underneath the panel. This can save a lot of space because you can place many objects there, and that makes it perfect for small homes and dorm rooms. It is relatively easy to install; you only need less than 15 minutes to assemble it with nothing but a hex key. So far, it is the most durable desk on our list with an incredible load capacity of about 900 lbs. The foot pedestals on this desk make it uniquely comfortable. It is also foldable, so you don’t need to worry about assembling it, and you can easily fold it to save space or for storage. The detachable surface board makes it even more portable. It is not as sturdy as other desks on our list, but who puts more than 250 lbs. on a computer desk anyway? That’s its load capacity by the way. When it is folded, it is so small that you can fit it in the trunk of your car, but when unfolded it provides you with enough space to put your monitors and computer on. If you’re looking for style, then this is your best choice. A very stylish desk that can be used as a computer desk or as an all-purpose table. It looks very modern, sleek, and professional. The limbs are small and thin, but it is very durable and sturdy. The top panels are beveled, polished and tempered safety glass. This table comes with a CPU stand and a sliding keyboard tray. The space under it is pretty broad; you can fit most household objects there or use it to stretch your legs. The perfect choice for gamers and people who use their computers for extended amounts of time. What else would you possibly need from a computer desk? The design itself is only excellent, and it is sturdy enough to endure 40 lbs. of monitors. Here, there is another edition of this table “Atlantic Gaming Desk Pro.” You should look at it as it more functionalities and features. So, if you’re a real geek or a hard worker, you should by now have decided which desk you are going to buy. You should look for the one that suits your needs and doesn’t take up much of your space. These are best gaming desk reviews you ever find.